The results of an experiment reported in this week’s issue of Science narrows the search for chameleons a thousand times compared to previous tests, and Müller, an assistant professor of physics, hopes that his next experiment will either expose chameleons or similar ultralight particles as the real dark energy, or prove they were a will-o’-the-wisp after all. Dark energy was first discovered in 1998 when scientists observed that the universe was expanding at an ever increasing rate, apparently pushed apart by an unseen pressure permeating all of space and making up about 68 percent of the energy in the cosmos. 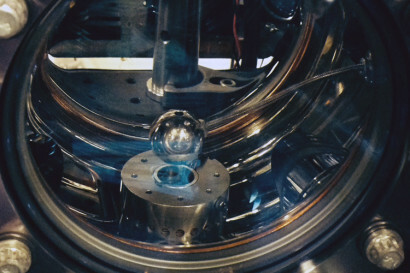 Several UC Berkeley scientists were members of the two teams that made that Nobel Prize-winning discovery, and physicist Saul Perlmutter shared the prize. Since then, theorists have proposed numerous theories to explain the still mysterious energy. It could be simply woven into the fabric of the universe, a cosmological constant that Albert Einstein proposed in the equations of general relativity and then disavowed. Or it could be quintessence, represented by any number of hypothetical particles, including offspring of the Higgs boson. In 2004, theorist and co-author Justin Khoury of the University of Pennsylvania proposed one possible reason why dark energy particles haven’t been detected: they’re hiding from us. If chameleons exist, they would have a very small effect on the gravitational attraction between cesium atoms and an aluminum sphere. Specifically, Khoury proposed that dark energy particles, which he dubbed chameleons, vary in mass depending on the density of surrounding matter. In the emptiness of space, chameleons would have a small mass and exert force over long distances, able to push space apart. In a laboratory, however, with matter all around, they would have a large mass and extremely small reach. In physics, a low mass implies a long-range force, while a high mass implies a short-range force. This would be one way to explain why the energy that dominates the universe is hard to detect in a lab. When UC Berkeley post-doctoral fellow Paul Hamilton read an article by theorist Clare Burrage last August outlining a way to detect such a particle, he suspected that the atom interferometer he and Müller had built at UC Berkeley would be able to detect chameleons if they existed. Müller and his team have built some of the most sensitive detectors of forces anywhere, using them to search for slight gravitational anomalies that would indicate a problem with Einstein’s General Theory of Relativity. While the most sensitive of these are physically too large to sense the short-range chameleon force, the team immediately realized that one of their less sensitive atom interferometers would be ideal. Burrage suggested measuring the attraction caused by the chameleon field between an atom and a larger mass, instead of the attraction between two large masses, which would suppress the chameleon field to the point of being undetectable. That’s what Hamilton, Müller and his team did. 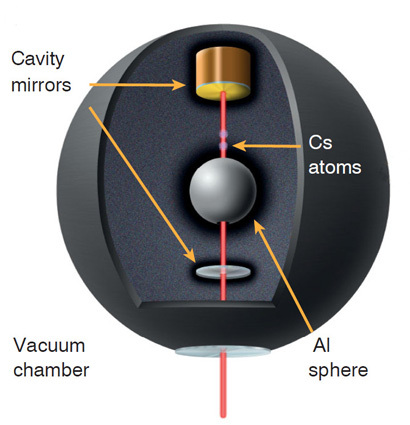 They dropped cesium atoms above an inch-diameter aluminum sphere and used sensitive lasers to measure the forces on the atoms as they were in free fall for about 10 to 20 milliseconds. They detected no force other than Earth’s gravity, which rules out chameleon-induced forces a million times weaker than gravity. This eliminates a large range of possible energies for the particle. Experiments at CERN in Geneva and the Fermi National Accelerator Laboratory in Illinois, as well as other tests using neutron interferometers, also are searching for evidence of chameleons, so far without luck. Müller and his team are currently improving their experiment to rule out all other possible particle energies or, in the best-case scenario, discover evidence that chameleons really do exist. New particles associated with dark energy typically imply a fifth force beyond the known strong, weak, electromagnetic and gravitational forces in the universe. In order not to conflict with known bounds on such fifth forces, a hypothetical new force would have to be camouflaged or “screened” by the matter around it – hence the name chameleon field. “Holger has ruled out chameleons that interact with normal matter more strongly than gravity, but he is now pushing his experiment into areas where chameleons interact on the same scale as gravity, where they are more likely to exist,” Khoury said. Their experiments may also help narrow the search for other hypothetical screened dark energy fields, such as symmetrons and forms of modified gravity, such as so-called f(R) gravity. The work was funded by the David and Lucile Packard Foundation, the National Science Foundation and the National Aeronautics and Space Administration. 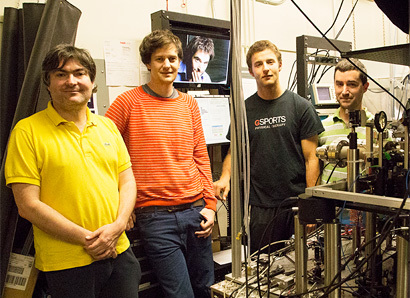 Co-authors with Müller, Hamilton and Khoury are UC Berkeley physics graduate students Matt Jaffe and Quinn Simmons and post-doctoral fellow Philipp Haslinger.